Begin your visit to the Oldest Town in Texas here! 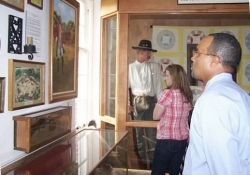 The Charles Bright Visitor Center is home to the Nacogdoches CVB and includes local historic artifacts and exhibits. Watch a video of the history of Nacogdoches and the surrounding area. Get visitor information including brochures, self-guided tour details, maps and gifts.